Posted on January 26, 2018 by Dr. Dale Rubenstein. Cats, like most of us, really aren’t big on change. They have their routine and change is confusing. So when we have to medicate cats or change diet for a health condition, you want to make sure you understand the vet’s recommendations for your cat’s care. There are several factors to consider. Don’t be afraid to ask questions about our recommendations for your cat’s care! Communicate with us! We as doctors may think we’ve explained your cat’s condition, but we know that what makes sense to us, may not be clear to you. (I’m not a computer person, so I always equate to that; some things I have to hear more than once to really understand). If you get home and can’t remember or it doesn’t make sense, or your spouse/partner/house mate asks what’s wrong with Fluffy and you’re really not sure, please do call us! We know that the better you understand your cat’s medical issues, the better, more informed care you can provide. So, if you have more questions, please do call or email us. Sometimes writing down your questions helps too. Medication for my cat: is it just this once, or for life? One big question is whether the medication will be short-term or life-long. The answer depends on the problem as well as your individual cat. A urinary tract infection requires a short course (usually less than one month), but a condition such as hyperthyroidism is needs treatment for the rest of your cat’s life. Again, if you’re not sure, let us know so we can refill your medication when needed and you don’t run out. Many conditions are in between, such as allergies and behavior problems. One cat might be able to stop the medicine if the condition resolves. Or you might be able to just use the medication during a bad allergy season. Other cats might need life-long treatment for the same problem. Typically, we’ll dispense about one month of a long-term medication, to make sure Fluffy will take the medicine. If she hates pills, maybe a liquid will be easier. Or, if the medication causes stomach problems or skin side-effects (soft stools/decreased appetite or an itchy rash), then we’ll need to stop it and try something different. Again, if your cat is having any changes or new problems on a medication, please let us know. Each problem and medication has different requirements for follow up. For example, treating hyperthyroidism requires balancing kidney function, thyroid function, body weight and other factors. Also, hormone levels tend to fluctuate, so even if Fluffy had a normal thyroid hormone level on one tablet given twice a day two months ago, today that might be too much or not enough. So, follow up lab tests are needed more frequently to make sure we’re always on the correct dose. 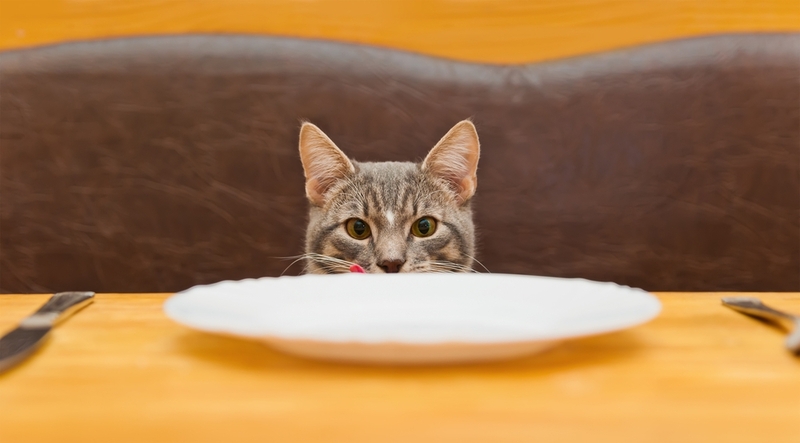 Cats can develop food hypersensitivities or medical conditions, such as diabetes or obesity, that require a change in diet. But, 1) cats still need to eat! and 2) they usually don’t like change. If Tiger has been eating dry food his entire life, he may not be excited about switching to canned food. So, we may dispense some foods to try, but please do let us know if this is not working. We can work together to figure out an alternate plan. Just as for ourselves, if your cat is overweight, weight reduction needs to happen slowly but steadily. However, if Fluffy is waking you up at night because she’s hungry, let us know and we’ll figure out what changes are needed. You need your sleep, and while Fluffy may need less food, we don’t want to make the entire household unhappy. Of course, our goal is to help your cat live the healthiest life possible. But we do understand that you are still the one who has to live with your cat, administer the medications or change the diet. So, please do call us if things aren’t going well, or if you have questions!